P/G PRIMER is a solvent-based, two-component primer system for use with DECK-O-SEAL® line. It aids in the adhesion of joint sealants to the interfaces of expansion joints in masonry, swimming pool decks, concrete, or wood. Depending on the porosity of the surface and joint dimensions, one quart (.95 L) of P/G PRIMER will be sufficient for 5 – 7 gallons (18.9 – 26.5 L) of sealant. Surface Preparation … Prior to application of P/G PRIMER, joint surfaces must be structurally sound, clean, dry, and free of oil, grease, dirt, and loose particles. Remove all curing compounds and form release agents from joint surfaces. Joints must be clean of bituminous materials and bituminous-impregnated joint fillers. 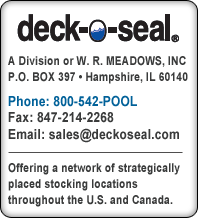 Control depth of sealant using KOOL-ROD™ backer rod from W. R. MEADOWS. All joints subject to total immersion in water MUST be primed with P/G PRIMER. Control depth of sealant subject to submersion with SELF-EXPANDING CORK EXPANSION JOINT or CORK EXPANSION JOINT from W. R. MEADOWS or suitable expansion joint to support the weight joint sealant is subject to. It is recommended an engineer be consulted for calculation. Note: Submerged joints should only be sealed by a professional and/or trained contractor. Mixing … Components are pre-measured to exact quantities; mix all material in both containers. Pour part A into part B and mix thoroughly with a clean wooden or metal paddle for approximately 3 – 4 minutes. Scrape container sides and bottom for complete integration. After mixing, work life is approximately five hours at 70° F (21.1°) (less at higher temperatures). Application Method … Apply P/G PRIMER to properly prepared joint surfaces by brush, depositing a light, continuous film. Normally one coat is sufficient; however, two coats should be applied to very soft, porous surfaces. Do not over-apply. Use caution when applying in joints with backer rods. Over-application onto backer rod can cause it to shrink and dissolve. PRIMER MUST BE TACKY TO THE TOUCH AND NOT ALLOWED TO DRY WHEN APPLYING SEALANT TO JOINT. P/G PRIMER is non-staining, but should not be applied to exposed surfaces, as discoloration may become apparent. Tape joint edges if necessary. Cleanup … Clean tools and equipment with xylene or toluene and remove masking tape before the sealant starts to set. P/G PRIMER is a flammable product and should be kept away from all sparks, flames, and heat. Safety glasses and chemical-resistant gloves should be worn at all times when mixing or applying the primer. Apply in a well-ventilated area. Use with adequate ventilation and block all HVAC ventilation ducts which may spread product vapors. Keep out of the reach of children. Refer to Safety Data Sheet for complete health and safety information.